Ride Reports and Photos | Lancashire Group Of Endurance GB. The weather on the morning wasn’t fantastic but at least it wasn’t too windy and the rain held off. 61 riders set off from the venue Barton Equestrian Centre helped across the motorway bridges by Evelyn and Arnold when needed, to do either a 15 km or 24 km route. The bridleway just after the duck farm had eroded very badly so I got in touch with Lancashire County Council 2 months ago to explain our predicament of sending 60 riders along a path with a large hole in it……the fantastic result was that instead of just filling it in they put in a new drain on BOTH sides of the stream and cleared away a lot of overgrowth making it much more user friendly…a big thank you to Stephen Williams for his support. The marking proved to be spot on with only 2 riders getting slightly lost as they were discussing their Christmas dinner and went past the turning into the duck farm but then met up with Bec and Max who put them back on the route! Dave Gaskell had bought a new lens for the occasion and I am sure you will agree his photos are fabulous……look on his website davegaskellpictures.com to find yours! The last bridleway back to the venue got a bit deep and muddy but when you consider 120 horses had used it that day it held up reasonably well and was certainly a better option than using a busy-ish road. Sadly, despite a poster at the secretaries’ desk and Linda the starter asking people to keep off the verges, a couple of our riders churned up a lovely grass verge in Goosnargh village and two riders went so fast past cattle in an open building that they spooked them causing some of them to fall over…. it makes me wonder what happened to the un- written rule of walking past livestock and through private yards/property? Hopefully this totally selfish behaviour of members of Lancashire group will not jeopordise the running of this ride in future years. This ride report cannot be complete without a mention of our lovely Alice who baked some delicious cakes and biscuits raising almost £50 on the day for her chosen charity of the Blue Cross animal charity. Many thanks go to all our helpers on and before the day, without them giving up their time we wouldn’t be able to put a ride on at all and also to Barton equestrian for letting us take over their car park and supplying scrummy refreshments on the day. Hope to see you all again next year. in it, open moors and long stony lanes, everyone seemed to enjoy it and asked if we was doing it again this year, two ladies traveled down from North Cumbria (over 2 hours) and where very happy and couldn’t wait to come and do it again. we even had a trophy for the best turned out Elizabeth Nabb won it. Yet again the weather held out for the Halloween ride, it was well supported with plenty of wonderful outfits, an end of season short ride but everyone always seem to enjoy the fun part of this ride. A big thanks to Sue Taylor-Green and her team of helpers and an even even bigger thanks to the support of all the riders local and from afar. I hope you have all been on www.whatabicture.biz for some brilliant photos. FORMBY PINK RIDE Saturday, 18 October 2014. A fabulous and most successful FORMBY PINK RIDE. We’d had heavy rain during the night but by 7am a breeze kept the clouds moving and eventually by 9am the sun filtered through. Folk were rallying around everywhere setting up camp. Jean Merchant and Janette Hunter made an incredibly difficult task look easy with the car park – imagine if you’d not all fitted in.… there were 87 of you!! Thanks to Sarah and Alison Bamber as Timekeepers, and our Marshall’s Barbara Bird and Maxine Braithwaite on CP1, Karen Corr and Evelyn Helm on CP2 and Graham & Amy Suthren (family of one of our riders) on CP3. Thanks go to our smashing guys from “RAYNET Voluntary Emergency Communications” giving us peace of mind with safety on this ride located at the venue and all Checkpoints (even they were wearing pink! ), Edwin Devey our Ride Photographer located in the CP2 homeward bound area of the beach with his pink beany hat. Not forgetting our Ride Marshall’s Sue, Carla and Jenny checking the safety of our Riders en route. Back at base we had efficient helpers Janet Bebbington and Pamela Dunn. Jackie Lloyd with her new and impressive EGB Lancs Merchandise display and Linda Cowperthwaite doing Tombola with Jackie raising £190 – Wow! The Ride en route was lit up with splashes of pink everywhere (horses and riders alike), as everyone joined in with the spirit of the day making the ride come alive to passers by – it was evident so much time and effort had been made! One walker on the beach even passed a fiver to a rider as a donation to our charity! After the ride and all horses washed and settled, was our fantastic HOG ROAST at the venue supplied by Graham & Sharron Eyes’ “Piggin Best” and beautifully served by Sharron and her helper. Due to our Betty’s 80th/Pink Ride being cancelled in August, we wanted Betty to feel special so we made sure she rode with bib No.1 on the ride, and afterwards, to eat her Hog Roast in comfort, we sat her at a pink table with matching parasol, balloons (blown up by Helen Fox), pink glasses, bubbly and a birthday cake supplied by Sue. As Jean and I were dealing with bibs, rosettes and points- cards in the Secretary’s trailer, the smell of the food was driving us nuts as we’d not eaten since 5.30 that morning and we “could have eaten an ‘orse!” but, oh my goodness, it was well worth the wait when we eventually went for our Roast! This is the part I dread, forgetting someone who’s helped make this day so successful, so may I take this opportunity of thanking EVERYONE that took part in any way (and you all know who you are). Lastly, a thought to those poor folk who were looking forward to the ride so much, even those who actually got on the ride from the waiting list but had to drop out due to one thing or another, how frustrating! Kirsten Nokling won £5 on the pink “Guess Her Name” horse – LIZZY and has donated it to our Pink charity, and Jamie & Cath Houghton & their horses won best pink getups. Big thanks to the Southport Council, National Trust and Natural England who permitted us to ride on their land and, on this special occasion, to increase our rider numbers to 99. Also to the Venue farmer who commented, “you’d not have known there’d been a ride here yesterday”, so thanks folks for clearing away after you, it IS appreciated. Update: Jean and I returned from de-marking the Ride the day after and were so glad it wasn’t held then as the route was amok with dog walkers everywhere, and the Rifle Range was in full swing too! Finally, get on the Photographer’s website NOW (www.whatapicture.biz) and have a look at the amazing atmospheric photographs, some good action pics there, venue photos at the end!! Please note: Edwin is donating 50% of his photograph profits to our Pink Cancer Charity so please buy loads of photos from Edwin folks. On a final note, donations are still coming in but we shall update the final outcome at a later date. This was a new venue and a new route for EGB riders. I think that everyone would agree that the venue, Barton Equestrian Centre was great, having plenty of hard standing, a café and toilets. The owners made us very welcome despite having a show jumping event going on today. 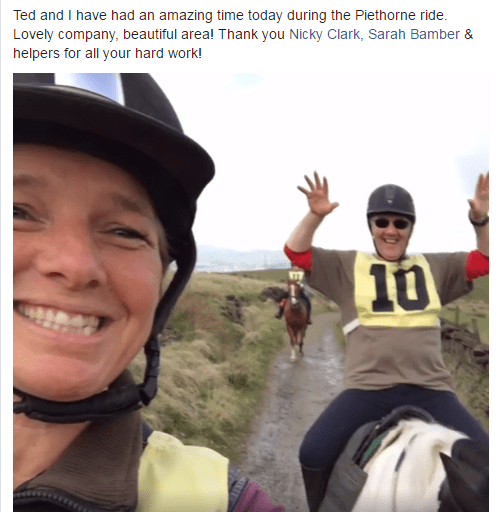 The route was entirely over public access land and can be ridden individually, BEC can be used as a starting point and they are happy to have you park there for a £5 fee, please phone beforehand to arrange. We had 46 entries, the majority of whom were non-members, hopefully some of these will have enjoyed their day out so much and be desperate to join our group next season. There were no major incidents to report and most people seemed to like this route whilst agreeing that it is not the easiest going. In fact it was almost not going at all as a few days ago large tree had come down across the ‘duck farm track’. Janet and I had a few nervous days watching to see if the council would clear the obstruction. In the end it was actually one of the farmers from the duck farm (ducks and turkeys soon being got ready for Xmas don’t forget, promised I would mention them) who went out with a JCB and cleared the track. At this point I must also mention BT. They had also gone out but in this instance to dig the track up removing the central grassed area which is usually so good for a canter, maybe next year… I know some people had difficulty crossing the ford but as far as I know no-one got more than their ankles wet, thank goodness it hadn’t rained too much recently. I do think the prize for perseverance must go to one of our non-members. Her horse had refused to load in the morning. Undeterred she arrived via different transport only to arrive at the venue to find that her horse loved it so much she didn’t want to leave and do the ride. In fact she loved BEC so much that she didn’t want to load and go home either and took a lot of ‘persuading’ that she really couldn’t stay any longer and it really was time for her to go home. Many thanks to all helpers who turned out today. Most of all to Cath Tomlinson, who is totally non-horsey, my colleague and companion for the trip to Cape Town in October as part of the Echo in Africa charity. [Have I mentioned it to you before? Only a couple of dozen times I hear you all shout]. Cath unexpectedly turned up at the venue and spent her Saturday acting as your checkpoint Marshall when the expected person didn’t turn up. Massive thanks to Janet Bebbington who has ridden and walked these paths with and without me over the last few weeks and who has harried LCC and coerced farmers to remove obstructive trees on time. Also out there was a new photographer, Beth, your pics should be on her website JustBEphotography, she can also be found on Facebook, please try and give her your support. Finally, apologies to all that the sunshine I had on order wasn’t delivered early enough and didn’t arrive until we were all back home, but it wasn’t too bad a day, was it!! A BIG THANK YOU FROM MAXINE TO ALL WHO SUPPORTED OUR ECHO IN AFRICA RIDE. I am now back from my trip to South Africa to scan children for rheumatic heart disease as part of the Echo in Africa charity. Our group was the last of eight groups to go out this year and we have scanned a total of 1560 children. The project will run for the next five years with new children being included and children who we have identified as having heart disease being followed up for that time and beyond. All in all a very worthwhile process. My own trip was in part funded by the ride we did earlier from Barton Equestrian centre under the auspices of EGB. Many thanks to all who attended. I am happy to answer questions that anyone has or alternatively they can access Echo in Africa website or their facebook account for further information. Little Crosby Ride Sunday 18th May 2014. What a great weekend of weather for this lovely ride, it has to be one of my favourites, you can see riders for miles criss crossing the countryside and enjoying themselves popping over the jumps, with very little road and plenty of grass its not to be missed. We always receive a very warm welcome from Glenda and her helpers they really are a friendly bunch. To finish off we had a butty and an ice cream. Great ride Glenda Thanks. Ulnes Walton Pleasure Ride Sunday 23rd March 2014 Well all went well today, after spending two hours marking the course yesterday the rain washed it all away, so out early this morning to remark. Hope everyone enjoyed the ride and the gentleman who went down the banking enjoyed his extra bit. A word of praise for number 18 who fell off on the riverbank hope your not to sore tonight. A great thanks to all who rode and a thanks to the helpers who we couldn’t run the rides without. Oh yes Pam’s Pea and Ham soup was delicious thanks Pam. http://www.whatapicture.biz/. Seaba Ride Sunday 23rd February 2014 Helen and Debbie always put on a good ride, and this one was no different, the rain held off and nearly 100 riders enjoyed a great day. And as usual that little added extra of delicious hot soup a biscuit crisps and a drink.Many thanks to everyone involved and Edwin the photographer got some rather unusual shots. View and buy at http://www.whatapicture.biz/. Heapy Hack 10th August 2013 a new ride which was enjoyed by all riders, the weather was great and Sue had a great turn out with approximately 80 riders. Thanks to Sue and her team of helpers for a promising new ride for the future. The Treales Ride Sunday 12th September 2010. Hexhamshire Trophy Ride Sunday 2nd August 2009. The Treales Ride Sunday 13th September 2009 was a great success – eighty plus riders turned out to enjoy the scenery and the sunshine. Hexhamshire Trophy Ride Sunday 3rd August 2008. This entry was posted in Ride Reports and photos by admin. Bookmark the permalink.